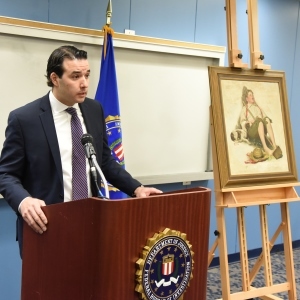 Norman Rockwell’s Boy Asleep with Hoe was returned to the family of its original owners in a ceremony with Chubb and the FBI on March 31 in Philadelphia. The painting has also been known by various titles through the years, including Taking a Break and Lazybones, and appeared on Saturday Evening Post’s September 6, 1919 edition. The painting was stolen from the Grant family’s Cherry Hill, New Jersey, home in 1976. Chubb insured the painting, paid the claim and acquired its title. 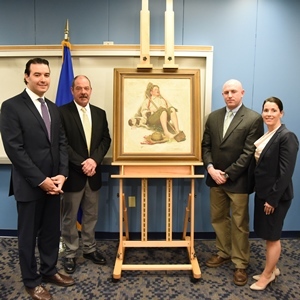 When the painting was recovered, Chubb worked with the FBI to return it to the Grant family. Chubb, a long-time supporter of the arts community, is proud to donate the Grant’s claim repayment to the Norman Rockwell Museum in Stockbridge, Massachusetts. Stockbridge was Rockwell’s home for more than 25 years, where he created some of his most iconic work. Founded with help from Norman and Molly Rockwell, the Museum today houses the largest collection related to the artist, and is the leading museum of American illustration art. “The theft of Boy Asleep with Hoe remained one of the art world’s greatest mysteries for over four decades. In partnership with the FBI, we’re pleased to return it to the Grant family,” said Fran O’Brien, Senior Vice President, Chubb Group, Division President, North America Personal Risk Services. 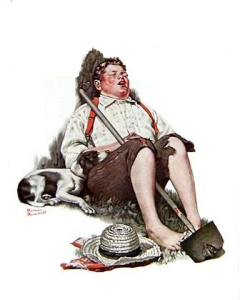 Norman Rockwell’s Boy Asleep with Hoe, also known as Taking a Break or Lazybones, was featured on the September 6, 1919 edition of the Saturday Evening Post. At the Philadelphia press conference where Chubb returned Boy Asleep With Hoe to the Grant family. From left to right: Rob Poliseno, Regional Executive Officer, Mid-Atlantic Region, Chubb; Mr. John Grant; Martin Mahoney, Director of Curatorial Operations, Norman Rockwell Museum; and Kelly O’Leary, Regional Chief Operating Officer. Chubb’s Rob Poliseno, Regional Executive Officer, Mid-Atlantic Region, speaks at the Philadelphia press conference where Chubb returned the painting to the Grant family and announced that the claim repayment would be donated to the Norman Rockwell Museum in Stockbridge, Massachusetts.